I had the fortune or the misfortune to get a chance at writing a theme song for a Canadian public affairs program, and I thought it would be a good time to write a song that I could say some things that were on my mind in, and I had to say it in a very quiet way so as not to upset people, you know, and I thought well it’s got to be subtle enough that they won’t understand what I’m trying to get across. It’s got to be simple enough that a lot of people can understand what I’m trying to say. So I was flown, I was imported, all the way from Los Angeles up to Toronto to do the New Year’s Eve program which was really dreadful, I must admit, it was just dreadful. And the reason it was so dreadful is because, you know, I made a few compromises. I was told not to let them put arrangements with me. And I should have - I should have gone along with the people who told me to do that but I didn’t because the arranger gave me a big long sob story about how he’d tried to transcribe my music from the tuning so that he could work with it and I really had sympathy for him there. And so he said, “well, gee, I’ve got all these string parts” and he showed me all these pieces of paper and I knew he must have worked on it a long time so I said OK. And then I went back after I’d done all of my filming for the day and that time it was about 9:00 and the show went on the air at 10 so I sort of curled up in my motel room to watch the proceedings. Well, first of all, I began the show. I think the arranger mixed it because the orchestra was way out in front and my guitar was just sort of like — the whole guitar, you know, in the background and I was somewhere in the middle so that all you heard were his arrangements which for the first song were — were just not right. They weren’t in the right key or something was wrong I don’t know. They were harmony lines — they have this dominant orchestra, this big orchestra and this girl sitting there sort of silent mouthing on the screen. That was the first awful thing and then they had on John Diefenbaker and he talked mostly about how winter was like a buffalo’s breath, and how they’d named a river after him in Saskatchewan and he was very proud. Diefenbaker Creek up there. 400 miles north of Prince Albert. Then I came on you see introducing for the new year the theme song of a public affairs program called The Way it Is and uh, oh I know another thing I did that was really terrible. They said, uh “gee, we hear you’re from Fort Macleod, Alberta, Joni” and I said “uh no actually I’m from Saskatoon, Saskatchewan” and he said “oh and well where would you — you know we’re really glad you’re here this New Year’s Eve and where would you rather be?” And I said, uh, “in Florida.” Here I was beginning the new year a Canadian and I didn’t say anything you know really Canadian like “I’d rather be in Moosejaw sir.” You know? And then to top it all off, one of the arrangements he had written for 4/4 as I was actually playing in 3/4 and that time they mixed us equally. And then to make matters worse, when I introduced the song called The Way it Is they, uh, ran the rehearsal take. So there I was on national television on New Year’s Eve saying “hey, uh, we better take that one over again.” That’s the way it is. I love this song and its lyrics! The song has beautiful and unique-sounding melodies and lyrics that really say "the way it is". What a great song--a time capsule of when things were in upheaval and generations were at odds with each other and not quite sure what to do about it. 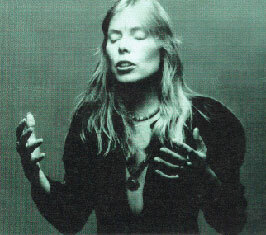 There are two performances of this song from Joni's appearence on the CBC TV interview show (ironically) with the same name as the song. Is there any other oddslot recording of this song? The music to this song reminds me of "Marcie" and I cannot understand why it wasn't even given achance to be as big a hit.